Quiddity is an all-encompassing business platform with CRM features specifically designed to simplify decision-making and help you focus on more important aspects of your business. 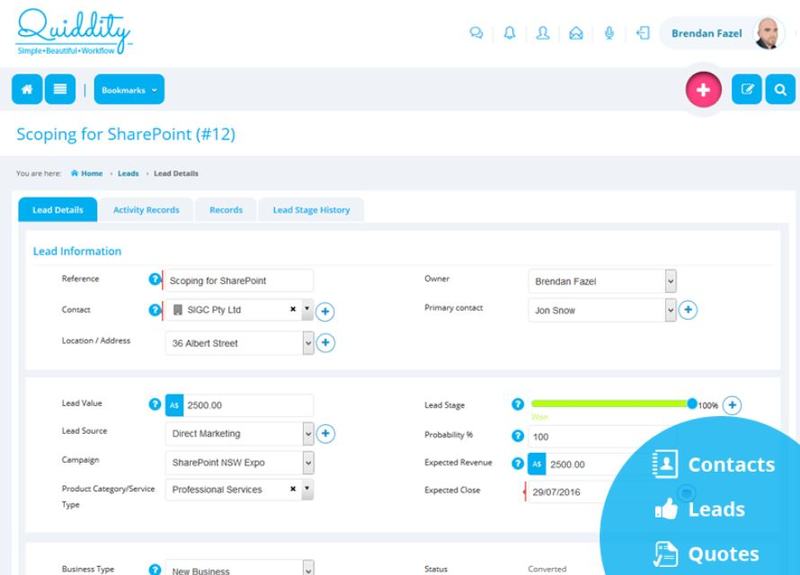 With Quiddity, you can improve your work efficiency, create business visibility, improve process flows, manage projects and multiple timelines and gain from a customer centric approach to improve your business. Pros: * Easy to use * Keeps track of client contacts * Lead,Quotation and Invoice tracking is fabulous- you can measure how many leads you have won or lost over a period of time * No more using Excel to keep track of client work or sales pipeline * Everyone in the company can see what is happening with the client using Activity record feature * Value for money, where else can you access a CRM system for such rate with full functionality? * All documents can be saved in one place via the cloud per client, which makes finding documents so much faster instead of trying to remember where you saved that document. * Fantastic communication tool internally, as everyone is able to see what is happening with any particular client at any one time. Cons: * Can be slow as it depends on your internet download and upload speeds * Difficult to set up on our own, we found that we needed the Quiddity team to help with setting up the fields correctly to suit our business. But once set up, it was a dream to use.